Two of the most in-demand smartphones at the moment are the Samsung Galaxy S4 and Apple iPhone 5. It’s natural that comparisons of these two phones will take place, as they are the dominant handsets on their respective platforms. However, when looking at the Galaxy S4 vs. iPhone 5, are some of the assessments unfair? We’ve had comments from many of our readers who do consider these kinds of comparisons to be imbalanced, especially considering the Samsung Galaxy S4 only released in April while the iPhone 5 was launched in September last year. Hence, there’s a 7-month gap between the two, which can make the world of difference when we take into account how quickly mobile technology is developing. One article we recently saw said that the Galaxy S4 had triumphed in speed tests against the iPhone 5 in the UK, and said that the iPhone 5 had “aged badly since its launch last year.” Of the 7 handsets put through their paces, the Apple iPhone 5 came in last position while the Galaxy S4 grabbed first place. However, surely this is to be expected when the Galaxy S4 model used in the tests has a 1.9GHz quad-core processor while the iPhone 5 is hampered by its 1.2-GHz dual-core CPU. Another recent report rated the battery life of 7 top smartphones. Again the Galaxy S4 smashed the iPhone 5, and it achieved 1000 minutes of call time. The iPhone 5 languished in second from last place with less than half that time, with 499 minutes of call time. Obviously the Galaxy S4 is an extremely notable handset and nobody is denying that. It might be a better idea though, to compare the Samsung Galaxy S4 with the upcoming iPhone 5S, as that is expected to release in September or October, just a few more months away. The iPhone 5S is expected to be an incremental upgrade to the iPhone 5 but of course nothing has been confirmed yet. However, rumored specs still include a larger battery capacity and an improved processor, dual-LED flash, a fingerprint sensor, higher-resolution display, and a 13-megapixel rear camera. It’s also likely to launch running iOS 7. It will certainly be interesting then to compare the iPhone 5S with the Samsung Galaxy S4, as this might be more relevant. We’d like to hear your thoughts on this. 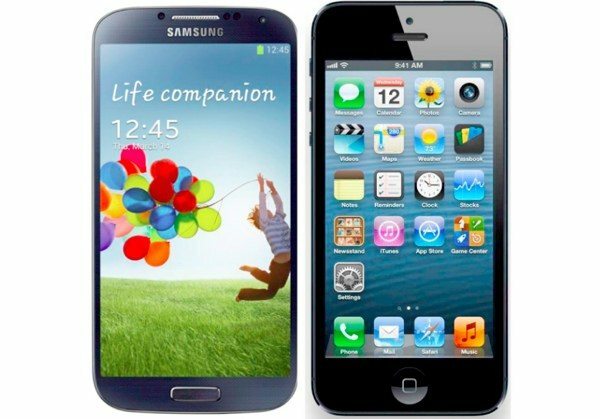 Whether you favor the Android or iOS platform, do you think comparisons of the Galaxy S4 and iPhone 5 are a bit unfair? Maybe you think the contrasts are perfectly reasonable considering they are the versions of these popular lines that are available right now? Let us have your comments on this. by the time they release iphone5s, s4 and 5s would be months apart again. would then result to unfair assesments. You could argue that a fairer comparison might be between the iphone 5 and S3, the latter S3 being released several months prior to the iphone 5 in that scenario. Which of course has also been noted as being both faster and with better battery life in most cases. So what is fair, Apple people? Is it only unfair because you’re not at the top of the list, despite paying for a top tier phone that for the most part is behind the majority of its competition in both hardware and software. Well, that’s also a part of a comparison. Since Android is an open platform, there are many manufacturers now (Samsung, HTC, Moto, Sony, etc. etc.) – and therefore new top Android phone models appeared much more frequent, then new iPhones. So nowadays top-Android phones would probably always be ahead of iPhones. I am not even talking of the diversity: you can pick any criteria (smallest phone / fastest phone / camera quality / waterproof body / longest battery life / etc) and find some Android smartphone that is better then the latest iPhone in this criteria. I guess you could call it unfair, but they still want $199 on contract for that 7month old phone. The S4 is that price or better and it’s newer. Its not unfair to compare what’s available for the price. Same with cars. If one is newer, better, and has a lower price that’s not unfair just circumstance.